The board of trustees of a Malden, Mass., charter school has unanimously voted to suspend its controversial dress code policy that caused students to be disciplined for wearing braids in their hair. According to the Boston Globe, the Mystic Valley Regional Charter School tossed out the section of the school’s dress code that prohibited hair extensions for the rest of the academic year after privately meeting Sunday to discuss a letter from state Attorney General Maura Healy, who called the practice discriminatory and warned the school to immediately stop enforcing its hair and makeup policy. Healy’s office got involved Friday, sending the letter to the school that told school officials that the policy violated state and federal law, CBS Boston notes. “There appears to be substantial evidence that the Hair/Makeup policy is—at best—inconsistently applied,” the attorney general’s office added. The letter then demanded that twin sisters Deanna and Mya Cook be allowed to participate in all school events. 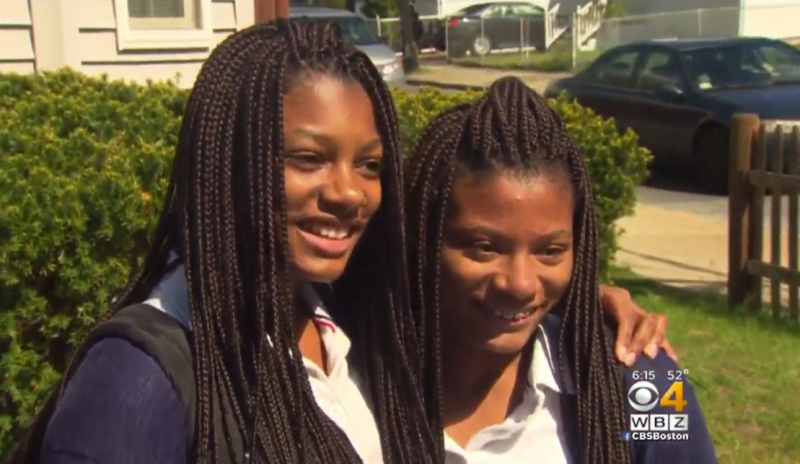 The 15-year-old twins, who had become the face of the protest against the policy, had been routinely punished, banned from the track team and other school clubs, and banned from prom because of their braided hairstyles. CBS Boston notes that Mya had already served over 15 hours of detention at the school because of her hair. On Sunday after the meeting, which lasted more than two hours, the school came back with a favorable decision. Those who have opposed the policy protested outside the school before the vote and later supported the suspension of the policy, adding that the suspension should be made permanent, the Globe reports. Mystic Valley has been under scrutiny by outraged parents after an apparent sudden crackdown by the school in April when it began punishing students for wearing hair extensions—a rule that parents said disproportionately affected black and biracial children. The school asserted that the rule was meant to diminish material things that could highlight the economic differences among students because of cost. The dress code also banned hair “more than 2 inches in thickness or height,” which Healey’s office said was an apparent reference to Afros and fades, which are, again, more likely to be worn by black students. Cook also pointed out that the school’s statement did not address the punishments that had already been served and remained on students’ records. “All of that needs to be wiped clean like it never occurred in order for us to be satisfied,” he added. Read more at the Boston Globe and CBS Boston.